Pandoro, has arrived in the warehouse. Finally! It’s the Italian golden treat for Buone Feste. True to its name, Bread of Gold, it is bright yellow inside, thanks to the fresh egg yolks Luigi Biasetto uses to make it. Luigi truly uses the best possible ingredients and a natural mother yeast which has been nurtured for 60 years (sixty years!!!) and several generations, giving it the perfect fluffy texture. Pandoro, originates from Romeo and Juliet’s hometown of Verona, in the Veneto region, a few kilometers from Luigi’s bakery in Padova. It’s a cake shaped like a dome, its sectioned like a star with 8 points. Contrary to other “commercial” Pandoro in stores, that are made several months before, this Pandoro was baked by Luigi Biasetto only a few days ago. How to serve it? For an extraordinary tasting experience, Luigi recommends leaving the Pandoro in a warm room (or near a heat source) for a few hours, before serving. When ready to serve, add the powder sugar (it comes with the Pandoro, in a separate little bag) and cut the Pandoro along the grooves into wedges. 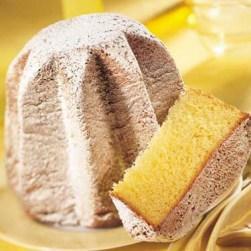 If you want to become a pro at serving Pandoro, this is our How To video. Next Post Piennolo Tomatoes – Best Tomatoes you can GET!! !